If you are planning a trip hiking in the backcountry, it is a good idea to have an assortment of backpacking adventure gear with you for any situation. Some things are necessary for almost any backpacking trip. Other items are more seasonal, and including them in your pack will depend on the conditions you are likely to experience on your hike. 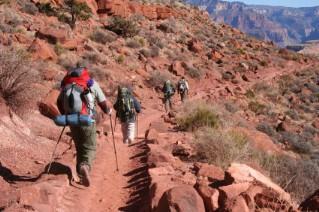 Careful planning is essential to get the most enjoyment out of your backpacking adventure. Map and compass: Always have them and know how to use them. Sunscreen and lip balm: Protect your skin to avoid sunburn! Sunglasses with UV protection: Protect your eyes from harmful rays. Hat with a brim: Keep the sun out of your eyes. Insect repellant: Keep bugs at bay during your trip. A waterproof flashlight and extra batteries: Even if you planned a day hike, you may get lost. Being lost in the dark is definitely no fun. Snack foods: Something that doesn't require cooking and will provide you with energy is your best bet for backpacking food. Try a protein bar, dried fruit or jerky. Additional clothes: Your day may start out sunny and warm, but you never know when the weather will change. Especially in higher elevations, unexpected storms without the right gear will ruin your hike fast. A basic first aid kit: Taking a class in first aid is an excellent idea for anyone, but especially if you are an outdoors enthusiast. Pocket knife or multi-tool: An indispensable tool that will amaze you with its many uses, every camper should have a multi-tool. Fire starter: Make sure to take waterproof matches, a magnesium block, or another kind of fire starter. Even if it is warm, a fire when you are lost will lift your spirits if you are lost as well as cooking your food. A water purifier: It is important to stay hydrated so drink a lot of clean water. Bottled water: Be prepared to stay hydrated. Toilet paper: Don't overlook this essential! Binoculars: You never know what spectacular sights you might come across. A mylar blanket: These are very lightweight but they will keep you warm. A whistle: This is helpful if you get lost. Duct tape: Can you think of anything it isn't good for? Thermal underwear: This can be lightweight or heavy depending on the season. A fleece jacket or vest: Be prepared in case the temperature drops. A wind and waterproof jacket and pants: If a storm pops up, you need to stay dry. Extra socks: You don't want wet feet for prolonged periods of time. Gloves: Lightweight or heavy depending on your climate. T-shirt: T-shirts make it easy to dress in layers. Pants with zip-off legs: You may prefer a pair of shorts but a pair of convertible pants can be very convenient. Keep in mind also that you will need to wear appropriate footwear, this is especially critical when carrying a large backpack. Don't leave this up to your local department store. Go to a store specializing in outdoor activities. They will have experts who can help you select the correct hiking shoes or boots. Make sure they are waterproof as well. If you are planning an overnight trip, you will also want to bring your tent, a sleeping pad and sleeping bag and a backpacking camp stove with extra fuel. Plus don't forget lightweight, dehydrated, backpacking food and supplies. When you consider things like the season of your hike, how long you will be gone, how far you plan to hike and the terrain you will encounter, then you will be able to plan well for your trip. Don't over-pack, but don't leave out essential backpacking adventure gear that could save your life, or at the very least, save your trip. Backpackers may also want to consider insurance for their gear to reduce the risk of losing money on lost or damaged equipment.